Miniart continues to provide very interesting sets of figures which are well time to accompany many of the new kits from not only their company but from others as well. This nice little set takes a set of older figures (tankers from set No. 35037, Soviet Self-Propelled Gun Crew) and by adding a lot of extra parts changed them over into a towed artillery crew. While it claims to be “heavy artillery” they provide three types of ammunition: 76mm, 122mm and 152mm. Therefore they can be used to serve just about any common Soviet WWII artillery weapons. Each figure comes with eight basic parts (head, torso, arms, hands and legs) with the long skirts in two parts for the figures in greatcoats. While the uniforms are of the later war period (late 1942 onward) the early war helmets are also provided in the kit. While the figures all originally came with tanker’s helmets (as an SP crew) the new options include several types of fur caps with the flaps either up or down and ten additional heads to change the personalities of the figures. The figures have a wide variety of weapons, including two regular Moisin rifles, two Moisin carbines, and two more rifles with sniper scopes. Four bayonets are provided for the weapons plus cartridge pouches. Five different types of grenades are included from the old fashioned F-1 style (Mills Bomb) to “potato masher” types, plus a revolver or a TT pistol. Two flare pistols are included, one loaded and one being loaded. Eight rounds of 76mm are provided as they came on the SP gun sprue, but the kit also includes two full crates of both 122mm and 152mm rounds. Each crate comes with packing, a propellant casing, and a choice of one of two projectiles (either HE-FRAG or HE for the 122mm and HE-FRAG or Concrete Penetrating for the 152mm). 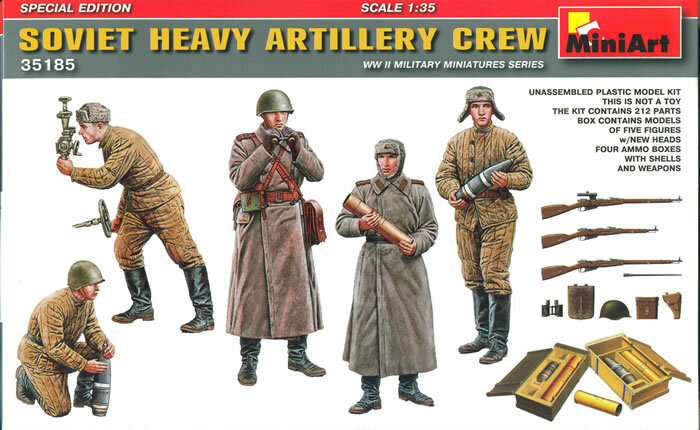 Overall this is a great little set and can be used with any of the Soviet artillery pieces in those calibers.